Personalized red 44” arc barrister auto - open folding umbrellas reminds of an old tale of “The Pied Piper of Hamelin” where a pied piper appears in Saxony and lures them to undisclosed location with his pipe. 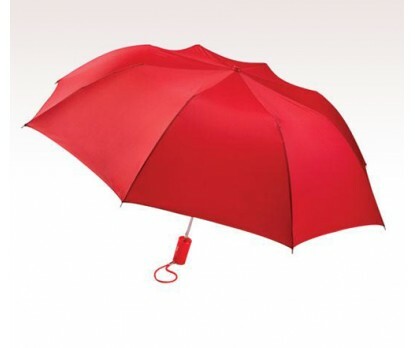 This umbrella acts the same in inviting attention and luring customers to their ultimate destination. Marketers are largely employing it for business gifting because they know it stands rare chances of refusal from anyone. Features – auto – open function, 44” arc red canopy, metal shaft, and plastic handle with carrying strap. Dimensions- 44" folds to 15". Imprint area – 9 ¼ “W X 6 ¼” H X 6” top.